Interest level for students 10 – 12 years of age. It has 14 ESL lessons and 42 pages. These textbooks were designed in cooperation with a Hong Kong company and have been tested in the classroom. Our Children’s Curriculum now has over 13,000 copies in print! Print as many copies as required. An encounter with hostile Lightspoilers on Saturn. Your students will enjoy their adventure! Student Book – 14 ESL lessons and 76 pages. Practice Book – 28 pages for 14 children’s ESL lessons with an interest level for students under 9 years of age. Interest level for students from 10 – 12 years of age. 74 pages and a final test. An exciting story line and dialogues that the students can role-play. The lessons also contain grammar exercises, crossword puzzles and word find puzzles. Reading, speaking and writing are taught as a part of each lesson. This book is available in Color and Black and White. The Color Version can be printed in Black and White, however the colors are distorted when converted to black and white printing (e.g. yellow is printed as white). If you are going to print the PDF documents in black and white, we suggest you purchase the black and white version. Books are sold in a printable PDF Download format. You may print as many copies as required. NOTE: If you plan on printing in black and white, we recommend the Black and White Version as printing the color version in black and white will not show contrast. After purchase, you will be re-directed to the download page. In addition, an email with download links will be sent the the email you use to purchase. If you do not see this email, check your SPAM folder. By Learning English with Laughter Inc. 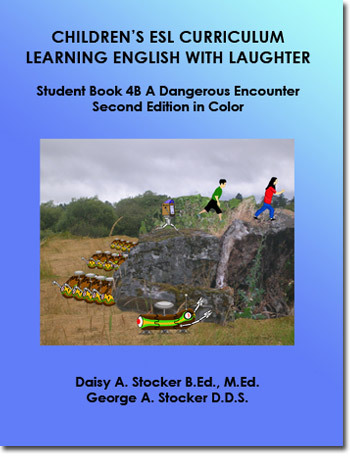 Published by:Learning English with Laughter Inc. Complete Workbook for Learning English at Home! With Full Audio Downloads!